So I got invited to a meeting at Janelia Farm today. Alas I cannot go because it is while I am teaching in the Spring. But in pondering the meeting (which is not posted currently on the Janelia site) I decided to snoop around and see what their other meetings looked like. And, as I generally do, I also scanned the meetings to see if they seemed to have diverse participant pools. And, well, the first meeting on their Spring meeting list alas did not look so good from a diversity point of view. This unique meeting will bring together directors of imaging centers and program leaders of open access infrastructures. Our goal is to create a platform to explore the frontiers in imaging technologies, discuss common challenges, and strategize how the global imaging community can build a common network to tackle the era of “big data” as well as rapid technological advances in microscopy. First glance did not look great so I dug into it a bit more. I tried to infer the gender of the people listed on the site by looking for their personal web sites or other descriptions of them to see what gender pronouns were used. When that was not available I guessed based on name or appearance. I know this is not ideal / perfect but it usually does a decent job of estimating gender balance for a meeting. Here is what I inferred (and color coded). Ok that is good. It has been shown that having a good gender balance of organizers can help lead to a good balance for a meeting. Well, this is pretty skewed. That comes to 22:4 male; female. The meeting I was invited to had a pretty good gender balance of invited participants. So maybe this microscopy meeting is an anomaly. But it made me wonder - does HHMI or Janelia Farm haver a diversity policy for meetings? I could not find anything in Googling around or looking at their web sites. If they do not have one, I think they should consider developing one. 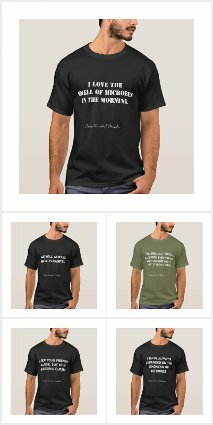 I did find many examples of what seems to be a commitment to supporting diversity in STEM by HHMI. But this meeting is definitely not doing a good job of that. 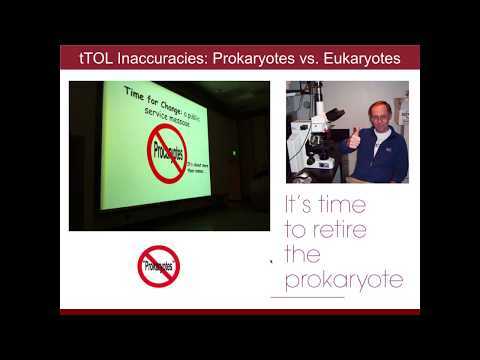 HHMI can do better. Open scholarship, such as the sharing of articles, code, data, and educational resources, has the potential to improve university research and education as well as increase the impact universities can have beyond their own walls. To support this perspective, I present evidence from case studies, published literature, and personal experiences as a practicing open scholar. I describe some of the challenges inherent to practicing open scholarship and some of the tensions created by incompatibilities between institutional policies and personal practice. To address this, I propose several concrete actions universities could take to support open scholarship and outline ways in which such initiatives could benefit the public as well as institutions. Importantly, I do not think most of these actions would require new funding but rather a redistribution of existing funds and a rewriting of internal policies to better align with university missions of knowledge dissemination and societal impact. Scholar provides several ways to keep up with research in your area. You can set up keyword alerts, get recommendations related to your publications and follow your colleagues’ profiles. Today, we are adding another approach to stay up to date in areas of your interest. Now, in addition to following articles by and citations to an author, you can follow research that is related to her work. To follow related research for an author, simply go to her public profile, click “Follow” and select “New articles related to this author’s research”. 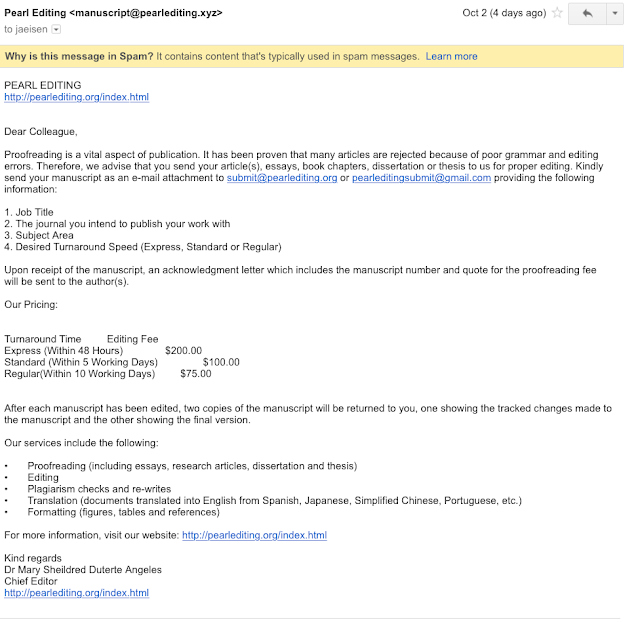 Scholar will automatically scan all new publications for articles related to her research and will send them to you as an email alert. This is particularly useful if you are a graduate student or an early stage researcher. By following related research for your advisor, your thesis committee and possibly a few key faculty members in your department, you would be able to see the research landscape from their experienced vantage point. It is also useful if, like myself, you are an industry or medical professional who isn’t active in the research realm but would like to keep up. By following related research for leading scholars, you will be able to quickly view relevant articles in key areas. 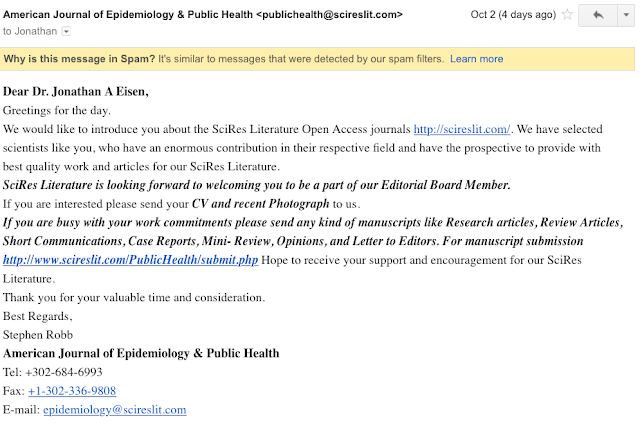 The astute reader has no doubt guessed that this can also be used to get email alerts for research related to your own work -- go to your public profile, click “Follow” and select “Recommended articles”. This is just sickening to me. I saw a news story that smelled funny: Breast cancer: Bacterial deficiency linked with onset. And I went and found the scientific paper and then the press release from the Cleveland Clinic that the news story seemed based on. And, well, the press release turns out to be ridiculous. It has long been proposed that the gut microbiome contributes to breast carcinogenesis by modifying systemic estrogen levels. This is often cited as a possible mechanism linking breast cancer and high-fat, low-fiber diets as well as antibiotic exposure, associations previously identified in population-based studies. More recently, a distinct microbiome has been identified within breast milk and tissue, but few studies have characterized differences in the breast tissue microbiota of patients with and without cancer, and none have investigated distant body-site microbiomes outside of the gut. We hypothesize that cancerous breast tissue is associated with a microbiomic profile distinct from that of benign breast tissue, and that microbiomes of more distant sites, the oral cavity and urinary tract, will reflect dysbiosis as well. Fifty-seven women with invasive breast cancer undergoing mastectomy and 21 healthy women undergoing cosmetic breast surgery were enrolled. The bacterial 16S rRNA gene was amplified from urine, oral rinse and surgically collected breast tissue, sequenced, and processed through a QIIME-based bioinformatics pipeline. Cancer patient breast tissue microbiomes clustered significantly differently from non-cancer patients (p=0.03), largely driven by decreased relative abundance of Methylobacterium in cancer patients (median 0.10 vs. 0.24, p=0.03). There were no significant differences in oral rinse samples. Differences in urinary microbiomes were largely explained by menopausal status, with peri/postmenopausal women showing decreased levels of Lactobacillus. Independent of menopausal status, however, cancer patients had increased levels of gram-positive organisms including Corynebacterium (p<0.01), Staphylococcus (p=0.02), Actinomyces (p<0.01), and Propionibacteriaceae (p<0.01). Our observations suggest that the local breast microbiota differ in patients with and without breast cancer. Cancer patient urinary microbiomes were characterized by increased levels of gram-positive organisms in this study, but need to be further studied in larger cohorts. That is it. Barely significant finding of some clustering of the microbiomes of breast cancer patients versus those of patients without breast cancer. And yet, this turned in the press release into cancer causing bacteria that they will be fighting with nanotechnology. Seriously. Sure, in my wildest dreams I would cure cancer too. Umm. No. Further studies are needed to see if these organisms play ANY role of any kind in breast cancer. Co-senior author Stephen Grobymer, M.D., said, “If we can target specific pro-cancer bacteria, we may be able to make the environment less hospitable to cancer and enhance existing treatments. Larger studies are needed but this work is a solid first step in better understanding the significant role of bacterial imbalances in breast cancer. Noooooooooooooooooooooooooooo. You have not shown anywhere that there are "pro cancer" bacteria and this quote clearly implies that you have. The study provides proof-of-principle evidence to support further research into the creation and utilization of loaded submicroscopic particles (nanoparticles), targeting these pro-cancer bacteria. What? This study does not provide ANY proof of principle of this sort. You have not shown there are any pro-cancer bacteria. This is ridiculous and offensive. No wonder the news stories imply that this study is about preventing breast cancer. The press release from the Cleveland Clinic is deceptive. It makes claims about the work that are irresponsible, misleading, and potentially dangerous. The Cleveland Clinic should be ashamed. 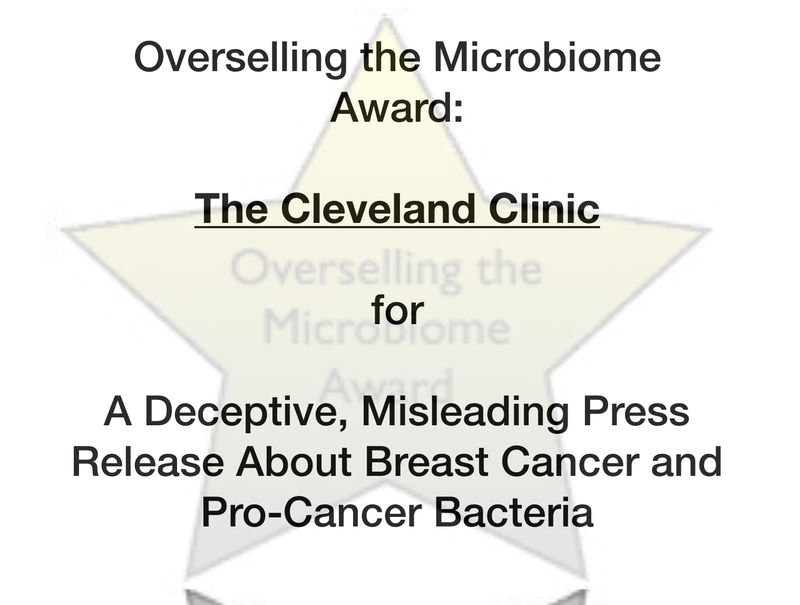 And thus the Cleveland Clinic is the winner of this edition of the Overselling the Microbiome Award. I would love it if I could just ignore my Gmail Spam folder. Alas, every once in a while I find important emails in Gmail Spam. So alas I cannot ignore it. 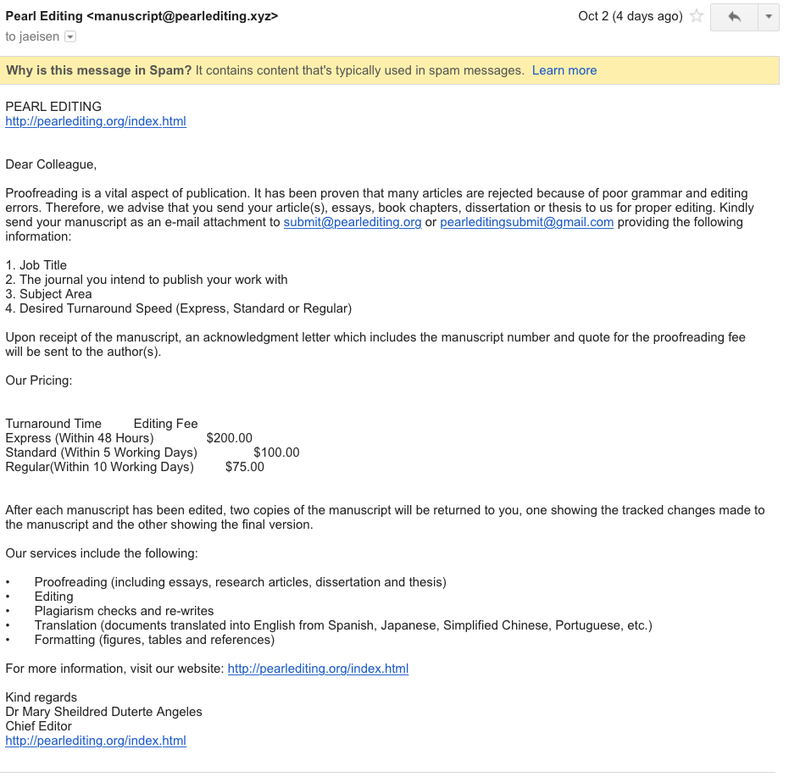 While digging through today I found a collection of "Science Spam" - that is Spam emails that have some science-y theme. Here are the ones from this week in my Gmail Spam folder that I identified as being Science Spam. 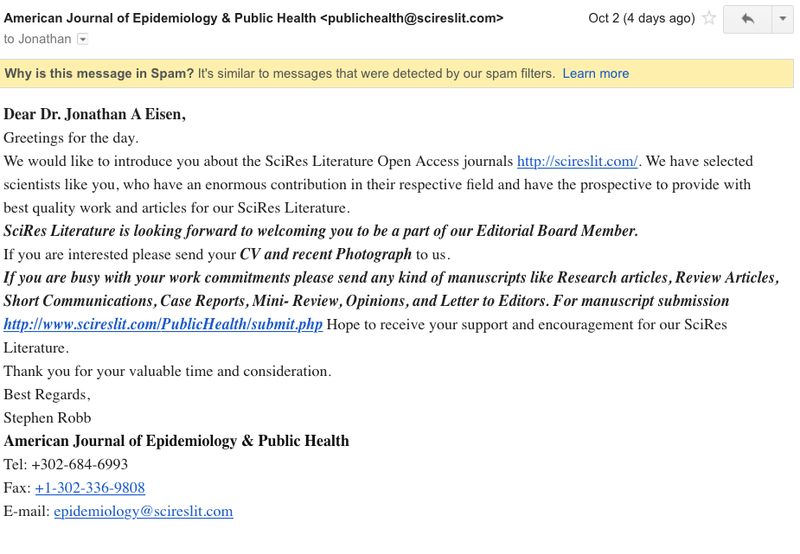 Most are invites from Spammy journals. Some are invites from Spammy conferences. A few are other things. Do other people get this much science Spam?